It’s time to be kinder to each other and ourselves. Lateral Kindness. That’s why we’ve started the SSHS Kindness Project. with kindness and to say sorry when we don’t get it quite right. Colonialism has kept us from ourselves and each other. Together we can make Lateral Kindness a Stl’atl’imx value. Take The Kindness Pledge today! How to Live a Decolonized Life. Stories and comments from members of our four SSHS communities. “My granddaughter and her friends came over to show me that they had learned to make xúsum ice cream. I was so happy that they cared about Nt̓ákmen, and the ice cream was delicious! "I spent 6 weeks in the hospital. I was fortunate to have family and friends visit. Hugs help in healing." 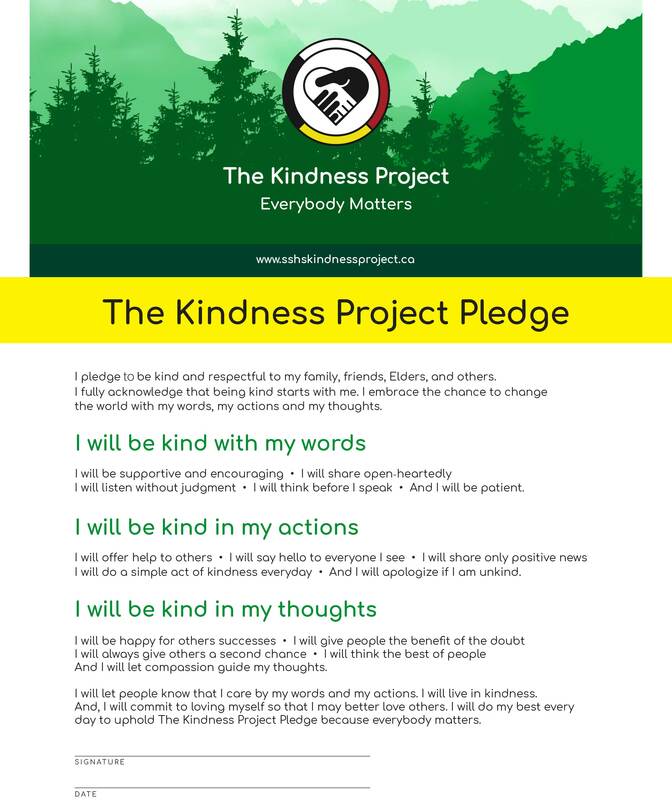 Take the The Kindness Pledge and print out a copy for your wall. Let everyone know that you are saying YES to Lateral Kindness!